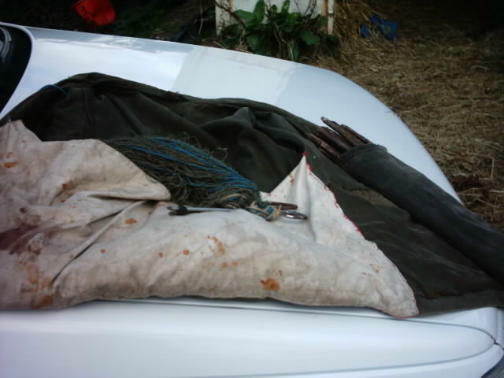 The first pic is of the inside of my netting coat. Notice that the coat has no buttons on at all, and the leg of a pair of jeans used as a quiver for my pegs. The white canvas is my pocket which will hold 150 yds of net. Next pic is placeing the end pin in the ground notice that the net is held in my r/hand at all times. for the purpose of the pics it is a 25ydr. The next pic is how to put the first peg in. holding the net taught with your r/hand,you twist the first peg around the bottom line with your left hand. Still keeping the net taught, you push the peg into the ground then you do a half hitch around the top of the peg with the top line. 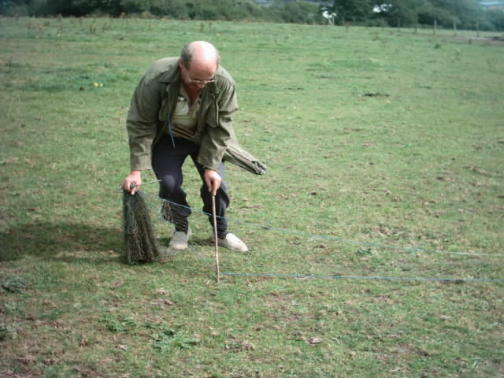 Once the first peg is in i usualy walk five paces before putting the next peg in which is done in exacly the same way as the first peg.On flat ground i find that 5 paces is sufficiant, if the ground is undulating i shorten the spacing of the pegs to suit the ground.And so you go on till all the net is out. 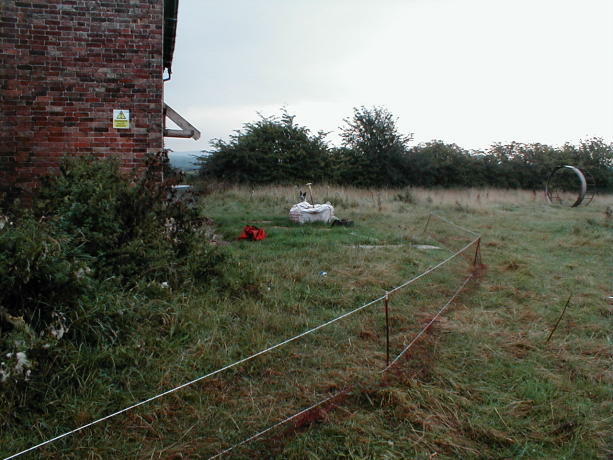 The last pic shows the net ready for use .Notice how the pegs slope backwards that allows the rabbits to stand on the net before they hit the wall of net and you will find that most of your rabbits will be caught by the feet. One word of advice i would give you is to practice setting the net during the day first as it will save you a lot of grief. Hi Teircel decent picture`s for the novice peggers to take note of. But the net looks real tight to me almost like a tennis net?? Maybe its the way the picture looks but i would like to add that there should be plenty of bagging in the net between pins. 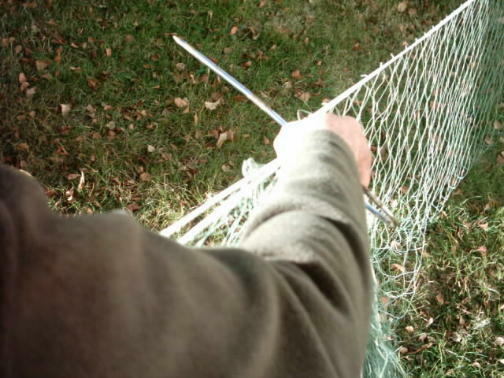 Only i tried a 15 yard ready set net almost identical to the one in the picture and i pinched so much net, well to be truthfull it should have been 10 yards. Vimm you are right the net is stretched tight i was rushing to get the pics and using a net with running slack.And i had not fed it back on right since the last time i used it. Plus i could not get the pegs into the ground as it was so hard, if you look at the end peg you will see that all the meshes are bunched there. How much give should there be in the net? Does the main line top & bottom get twisted round the uprights if so how many times? leon the net its self should have as much slack in it as possible but the head lines and footrope should be taught. 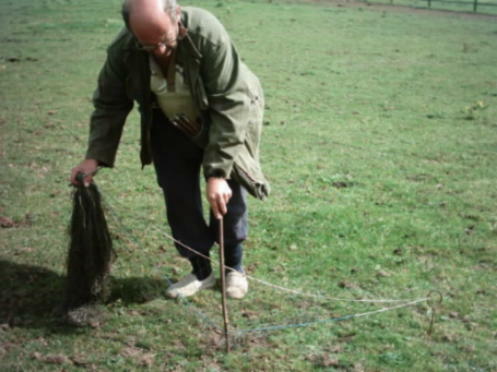 TC if you can have as much slack as poss what is the minimum height you would set the net at? sorry to be a pain but trying to get some sort of measurement as pics are deceiving. TC You obviously know your stuff about long netting and i am sure your advice and tips will be of great use to others. One tip about your photo,s though, either wear your cap or get your good lady to put some make up on your head as the glare takes the clarity from the main picture. We had trouble getting pins into the ground yesterday tearcil. I nearly broke a few myself trying to get them into the ground. The usual tension of the net was pulling the pins side ways and almost colapsing the net. 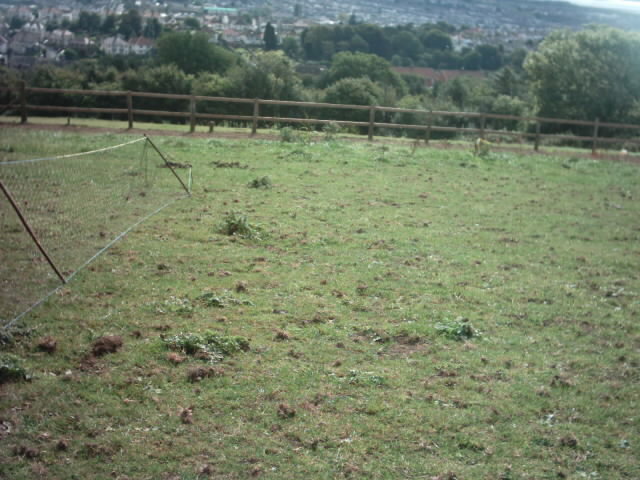 My old mate he had a 50 yard ready sett with aluminium pins they went in a treat. 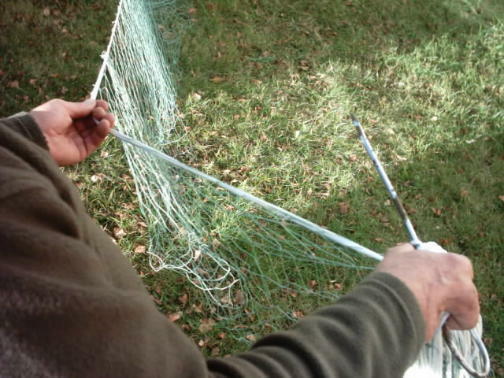 A super way how to stop rabbits if there`s to many hole`s to net day time. But like you said the grounds rock hard i dug quite a few times yesterday through compact rock and stone and the dirt in between was just like powder. I has trouble seeing into the holes once i had broken through. for what purpose do you use these nets? Hubertus the nets are used for catching rabbits.You place them between feeding rabbits and where they live then drive them into the nets.All done under the cover of darkness usually. It seems that you are having trouble picking up your nets Leon try this meathod it works for me. 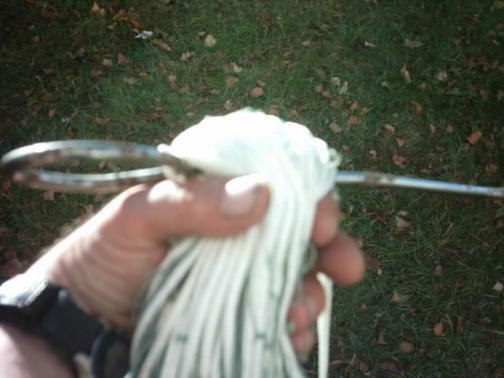 First when your net is down you pull up one of your end pins,it helps if you have the bag of the net on your left. Next place the end pin through the net next to the top line and then with your left hand grab the two lines about 18" down the net and pull it towards you like this. Then you just keep doing the same thing all away allong the net,till all the net is on one end pin. 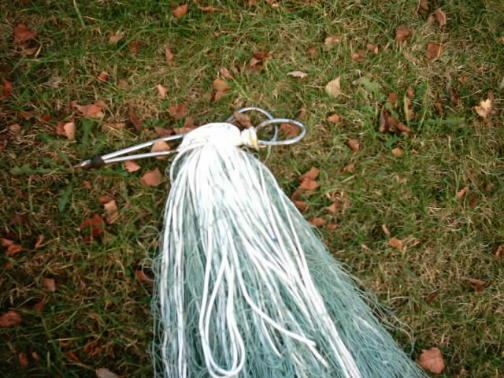 You then should have a net looking like this just wrap the ends of the lines around the net on the pins and stick a elastic band on the end, and you are ready to go the next time. The way i have said to do this the net shoots out no problem the next time you use it, it should end up looking like this. Cheers TC you've pulled me out the s*!t again. Top pictures TC. Ive never seen a longnet set before especially single handed you have obviously done that a few times before.Thanks for the info. 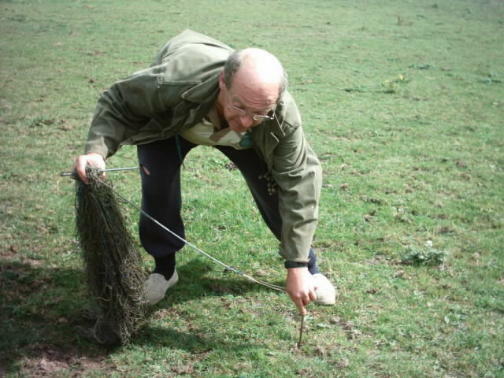 Thats the way i like to pick me long nets up, but when I lay them, I just put one end pin in the ground, run all the net off the put the other end pin in the ground so the net is tight, then peg it up. An uncle of mine, who used to catch a lot of rabbits up until WW2, told me not to try longnetting in bright moonlight because the rabbits scream like hell. Perhaps it was because he was nearly allways somewhere that he shouldn't have been.